Emily and Lexi enjoying the deep snow. 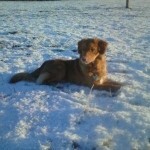 Lexi is a Nova Scotia Duck Tolling Retriever sired by Bomber our Canadian Champion Toller stud dog. Bomber is producing some real quality pups with fantastic temperaments and excellent shape and structure. 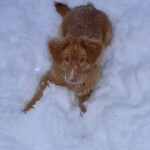 Lexi the toller enjoying the snow. 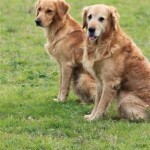 Working Golden Retrievers out and about. 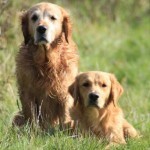 Update from Basil and Ross, Ross is a working Golden Retriever sired by our proven Golden Retriever stud dog Flint. They seem to be enjoying this years shooting season. They really do have the X factor! 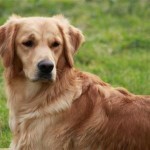 What a good look working golden retriever. 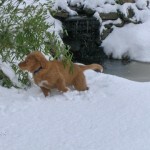 Just to let you know that Fingal is still doing really well and loving the ton of snow that we’ve had. He’s getting lots of attention because the schools have been closed and the boys and their friends have been playing with him outside. He looks a little bit sad in the second photo there, but he really isn’t! He’s been doing well at puppy classes, apart from weeing on the floor one week ( the only person who was phased by that was me!) and can do sit and down pretty reliably and is learning heel. 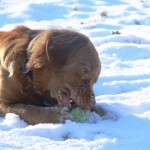 He likes to play fetch although only a few times and can dribble with a football too. 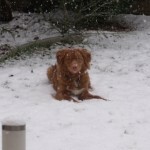 He’s a bundle of fun and so sociable everyone takes to him, although he nearly went off with the postman yesterday so we have to keep an eye on him. He has the occasional accident in the house, usually later in the evening when he’s tired and is good about asking out for a poo. We’ve kept him on the same food, up to 320g a day and this seems to be suiting him well. 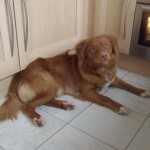 He’s going to be very like bomber and has a lovely nature, full of mischief but does take a telling. We’re all really enjoying having him and he seems to be having a whale of a time too. He’s made such a difference to our lives I would not have believed it! We’ll keep you posted with his expoits. 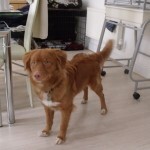 Chunky nova scotia duck tolling retriever puppy, Fingal. Dexter the Little river dog. 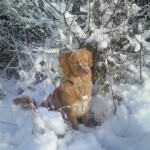 Hi, iv attached a few new pictures of Dexter. 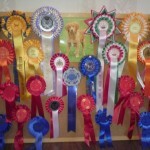 He has been doing agility now for about 7 weeks and is on course to do very well in competitions due to his ability to learn very fast, he hasn’t jumps to full sized jumps yet due to his age but they shouldn’t cause him any problems. He will first be able to compete in august and i am expecting him to to get at least clear round rosettes with the progress that he is making. He has also started ring craft classes so fingers crossed. Cairn Tolling in the Highlands. 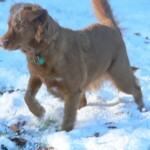 Hi All, here are some pictures of Cairn having some fun in the snow over the last few days. 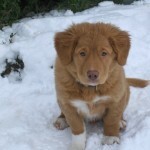 It was nice to see other Nova Scotia Duck Tolling Retrievers at the Gundogs Of Scotland show earlier this month as we don’t see many up here and winning best Toller Puppy she will meet her brother Donald at Crufts which will be good to see how they compare. Cairn is doing well at Obedience and starts her puppy Agility training in Dec. They wont find me here! 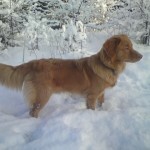 Donald the Nova Scotia Duck Tolling Retriever. 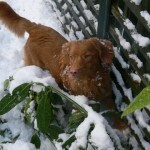 Donald the Duck Toller in the snow for the first time and take a look at the rosettes and still only 9 months of age. Well done!